Push Notification for Website, No Mobile App Required. Increase reach, revenue, re-target users with Push Notifications on desktop and mobile. A New Way to Reach Users. With 1-click subscription and no forms to fill, easily convert your visitors into subscribers. Push Notifications give real-time access to your subscribers, and instant repeat traffic. Interact with your mobile visitors directly by sending native notifications without any mobile app. With no personal details required, get higher opt-in and better conversions with direct push notifications to your visitors. Target particular individuals by sending personal recommendation based on their interests. With our integration visitors will be automatically prompted to subscribe to your site and in just 1-click get converted to subscribers. No need to ask for email or any other information. This gets you higher opt-ins, minimizing annoying pop-ups. 1-Click subscribe works on both desktop as well as mobile devices. Given that push notifications are clickable, you instantly get an audience which can be re-engaged with more content. Tap into user interests with Audience Creator and target them based on keywords, URL opened, number of visits, location, device and OS. This will create a highly engaging notification campaign personalized for a subset of your audience and there’s no limit to the number of these custom segments. With first and last time of visit, revive your older popular content by targeting it to new subscribers.You can also add your own custom attributes to define events or ROIs. Targeting notifications to these precise sets would result in better user-experience and a loyal subscriber base for meaningful engagement. Push Notifications are short and delivered instantly, it is important to use the best combination of title, image and message to get most out of it. This is where A/B Testing can help. Easily create two variations of your notification with different image, title or message. Then we determine the notification that is getting better response from a subset of your subscribers, and push it to the rest, resulting in more conversion as well as revenue. With each test you get to know your audience better and improve your notification strategy. Create use-cases by using your data and our two powerful APIs. For example, individuals can be targeted based on what they were looking at earlier and then informed about an upcoming sale or discount voucher on completing a purchase. By leveraging your data, and PushAlert Subscriber IDs even a customized notification can be sent with say, a name, to individuals about an abandoned cart or shipment of products. This builds loyalty and trust, getting you a customer for life. Keep a track of your notification campaigns with relevant metrics including impressions, clicks, delivery rate and CTR. Our advanced analytics help in studying the performance of your campaign across different audiences, devices, browsers or OS. We can also help in figuring out when notifications are likely to get more clicks to optimize delivery. Get campaign analysis with relevant metrics to improve strategy. Know when your subscribers are most active and plan notifications accordingly. Get an insight into which devices, OS or browser your visitors are using. Convert the entire push notification subscription process in your own language to get more subscribers. Customers/visitors will be able to know exactly why they should subscribe to updates, that too, in your own words. Moreover, you can customize the design of the opt-in prompts with themes and show the prompt in the language of your subscribers to get more meaningful engagement and higher opt-in. PushAlert works with all major browsers spread across a variety of devices and platforms. 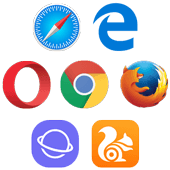 Google Chrome, Mozilla Firefox, Apple Safari, Opera, Microsoft Edge, Samsung Internet Browser, and UC Browser. Windows, Android, Linux, ChromeOS and MacOS (OSX). Don't Wait. Engage Your Users Now.